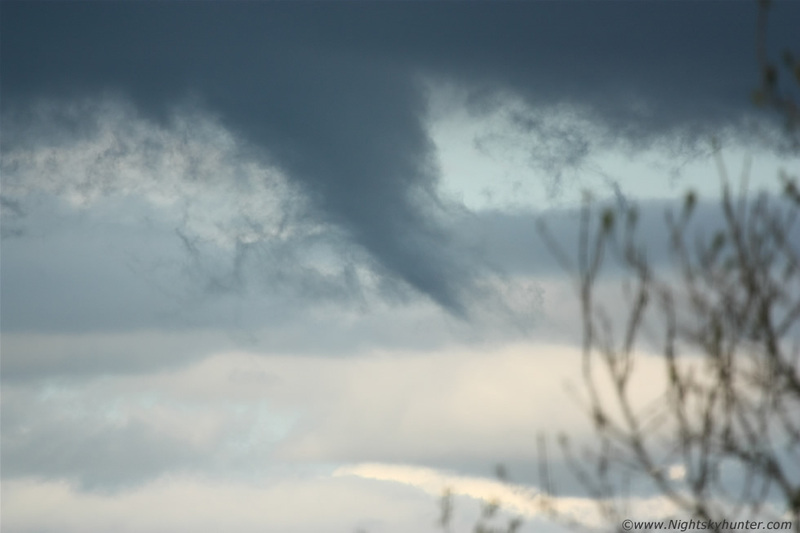 Forming funnel cloud over Omagh on May 28th 2013, this was shot with the telephoto through a gap in a tall wire mesh fence looking towards a new base which had moved into view. The atmosphere was weakening and we were loosing the instability and heating so activity was dying away rapidly, however this line of towers didn't want to give up without one more try. We had two areas of interest hanging from the base, one of them shown here was trying to form another funnel however it didn't quite make it, I saw rising/inflow motion to the scud and in the viewfinder there was slow rotation, suddenly the bottom of the feature tightened up into a smooth shape like a funnel and I snapped it at it's prime, seconds later the base became loose and the whole thing opened up so this was a semi funnel or attempted funnel or scud vortex or whatever you want to call it, it had been an amazing day, we got a funnel cloud outbreak, nice clouds, great scenery, soaked up the sun and had a great road trip which made for another great experience and memory, read the report for more information. * All images are available for sale in the form of photo prints, canvas or digital files for licensing, if you are interested in a purchase simply drop me an email.